You will have seen Cattleya Orchids many times and probably did not know the name, they are widely used as corsages as well as in floral arrangements. As for growing them, these are fairly hardy plants, easy care and cattleyas are good orchids for beginners. The genus has over 60 species and Cattleya Orchids are originally from tropical Central and South America, they do well in warmer situations. The cultivars are numerous and colorful. The orchid pictured right is a Cattleya cultivar ‘ George King’. Flowers will last for around 3 weeks, depending on the species and the growing conditions. These orchids flower once a year and this also varies depending on the species. As for the name, they are named after Willian Cattley, an English botanist. Here we look at temperature, humidity, light, fertiliser and watering techniques. 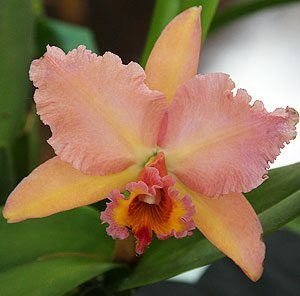 The one big requirement for Cattleya Orchids is warmth, if you can provide this then other care factors are easy. In cooler climates they are best grown indoors or in a greenhouse. Frosts must be avoided. Look for a daytime temperature between 15 C and 20 C in winter 20 c and 30 C in summer. Humidity is also important, you can us an Ultrasonic Humidifier which are readily available for sale online. Light is the second factor and good morning sun seems to work well. As with many orchids drainage is important and Cattleyas do like to dry out a little between watering. Remember that they are epiphytic, and try to mimic this natural habitat. Watering is best carried out when the soil becomes dry, around once a week, although this will depend on the climate and the growing medium. Fertiliser is best kept to a minimum and it should be a low nitrogen fertiliser. A 1/4 strength application applied during active growth and warm weather twice a year is adequate. Always flush the growing medium with clean water between fertiliser applications to avoid salt build up. When repotting, remember that they an orchid that prefers to be a little pot bound, so do not over pot. Refrain from repotting until the plant really fills the pot, or the growing medium begins to break down and remain to wet. They are naturally epiphytic and require an open porous potting mix. During the winter months plants can be rested and this is also an excellent time to divide them. Good clean green foliage is best, some will have a few marks naturally and will not be black, rather a deep red to purple. The plant should be growing in a clear pot, so you should be able to see a healthy root system, the root system should look good with no mould or rot. Flowers that have small uneven streaks of colour may indicate a virus. Wrinkled leaves, or pseudo bulbs indicate dehydration and maybe a poor root system. Water in the leaf crowns will also cause problems. These are a highly hybridised group of orchids and it is these hybrids that are generally offered for sale. A number of species are truely garden worthy and two are listed below. 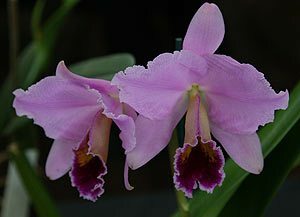 Cattleya intermedia is an important species from Brazil, used widely in hybridisation. This is a species that comes in a number of forms so photographs will differ greatly. This is a species that comes from more temperate areas however it still requires more warmth than the cooler areas of Australia will provide. 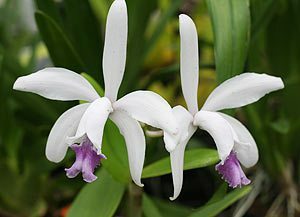 Cattleya percivaliana is known as the Christmas Orchid, this is another varied species with flowers ranging from white through to pink and mauve. Slightly smaller than some species but with very attractive colouring. This is a Venezuelan species and again requires warmth. Grown both in containers as well as a mounted species. Regular watering is required.